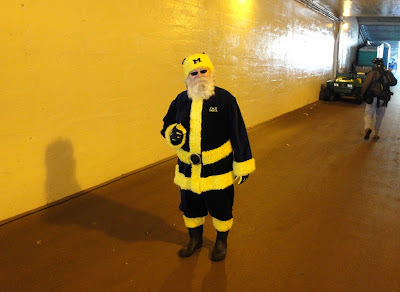 We first brought you Michigan Santa last year, but since we're in a lazy giving mood, we'll dust him off and recycle him for 2011. I actually snapped this photo in the tunnel prior to the Purdue game in 2009, which was in late October of that season, but whatever. Posting, which has been pretty light around here these past couple weeks, will continue to be so for a few more days. We fully expect to unleash an onslaught of content in the week leading up to the Sugar Bowl, so look forward to that. See how I oversold that? I need to work on my oversell/under-deliver issue. Merry happy whatever holiday you celebrate.